In this edition of our Sound Like series, Matt and Rabea have unlimited budget to nail the tones of Mastodon guitarists Brent Hinds and Bill Kelliher! With 7 Studio albums under their belt, Grammy award winners Mastodon have been redefining the sound and shape of heavy metal for over a decade. The Band’s progressive style and seismic sound is due in-part to their wide range of influences; a combination of classic rock, thrash metal and even a bit of country & bluegrass makes for a truly unique and instantly recognisable sound! Before we begin, let’s take a listen to some of the huge tones that Mastodon guitarists Brent Hinds and Bill Kelliher are known for. You’ll know that Mastodon have achieved some of the biggest guitar tones on the planet in the last few years and have even gone against the rulebook when it comes to metal guitar tone. They generally use heavy drop-tunings but on normal scale guitars. This is an interesting approach because their amp and pedal setup gives them a tighter bass and low-mid response yet in theory, tuning low on a normal scale guitar should sound more ‘flabby’ than normal. But this helps Mastodon achieve a loose sludgy feel with a tighter low-end than you’d expect. Rather than scoop the mids, Mastodon make sure that their guitar sound has plenty of mid dialled in. This is so that the guitar will be heard under all that distortion. They use British style amps to achieve this and crank the amps (and the gain) up to 11. As for effects, they tend to dial in loads of different tones (Especially modulations, reverbs and delays) with the axe-fx but an Octave pedal and a TS-style overdrive will get you close. Please remember that these sounds haven’t been endorsed by Mastodon and we are just offering some advice on how to get similar guitar sounds. Also, never follow the rulebook and feel free to take these guidelines a step further and create your own sound. To nail that heavy Bill Kelliher tone you need a fat sounding, LP style guitar. Fortunately this is easily achieved with his two signature ESP guitars. We’ve chosen his singlecut LTD BK-600 which has a familiar feel and design to other LTD guitars but with a very big difference at it’s heart. The pickups. These are hot without being super modern or scooped sounding. In fact they’ve got a mid-range sweet spot that works well with his Friedman Butterslax amp to give you an aggressive, throaty mid-range sound with an open, dynamic low-end. Perfect for drop-tunings and especially good with the high gain channel cranked on your amp. Kelliher has got another signature LTD which is called the Sparrowhawk for the more open-minded player. This offset body shape has similar spec to his BK600 but with Divinator pickups instead which are slightly lower resistance pickups but still retaining plenty of heat! To get in the Kelliher ballpark you’ll want a meaty sounding guitar like the LTDs with clear sounding medium/hot pickups. This is what will give you the clarity you want under all that gain! Brent Hinds is a famous Gibson user. He’s been seen using everything from Flying Vs to SGs and Les Pauls! He even has a signature Epiphone Flying V which was designed to give you his powerful signature tone. Go for a guitar with powerful passive pickups and enough mid-range sizzle to cut through loads of gain. It’s no secret that Mastodon use bucketloads of gain on their guitar tones. But what is interesting is how they still retain note definition! The easiest way to nail Kellihers amp tone is by using his signature Friedman Butterslax amp. He uses channel 3 so that he can really pile on the distortion. The Butterslax is a tight sounding 100w head, so you’ll want to avoid any flabby low frequencies (Especially with the lower tunings) if you decide to use something different. It’s powered by 4x EL34 tubes which give you that classic British sizzle but with all of the modern low-end you need. 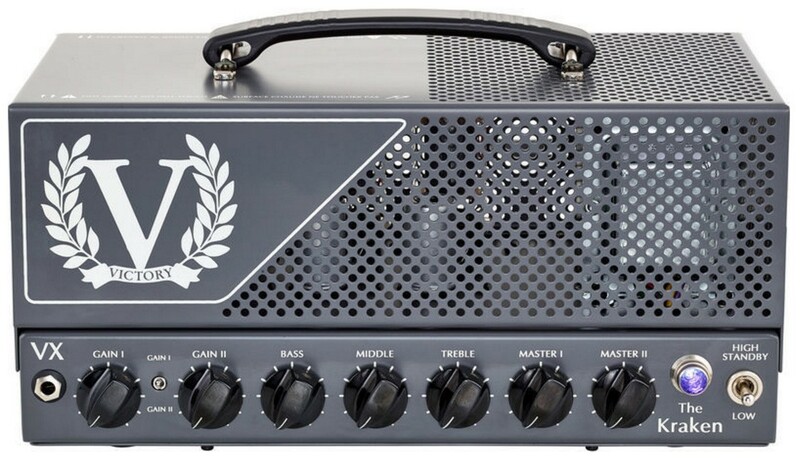 Rabea chose the Victory VX Kraken to get the Brent Hinds sound. By using channel 1 (The ‘British’ side of the amp) he was able to achieve that signature fatness that Mastodon get. But in a similar way to Bill Kelliher, Brent Hinds doesn’t lose clarity by cranking the gain and scooping the mids. Instead, he keeps the gain up and uses high output pickups (With a present mid-range) to get that brutal tone. Brent Hinds currently uses a JMP and a Diezel to get his tone so if you want to be spot on then you’ll want to have a healthy dose of British overdrive with powerful German distortion. Why not try the Diezel VH4 Preamp/Overdrive pedal into a clean amp to get that tone? The octave is there to fatten up the low-end and beef up any rhythm tones. Traditionally you wouldn’t use it over your lead tones. But by dialling in octave onto your dry signal (This is easy to do with something like the EHX nano POG,POG2 or Boss Super Octave) you can add chunky bass notes without making your tone muddy. Any TS-style mid-range overdrive (Try the Maxon 808 or an Ibanez Tubescreamer) will be useful for getting the Brent Hinds tone. Turn the gain all the way down and set the tone where you want it and just watch how it tightens up the low-end on your dirty channel. Rabea found that adding a Klon style pedal (RYRA Klone) into the mix works wonders for the Mastodon tone. It adds a touch more gain but also saturates the sound a bit which’ll just help in fattening those riffs and tones. For EQ Pedals Something like the BOSS GE-7 will just allow you to take out some of the high-mid and remove any fizz that you might have from running so much gain. It’s worth having a delay and reverb (or combo pedal) in your effects loop or at the end of your chain to warm up those lead sounds. Having the delay and reverb on for the single note runs will give your tone space in the mix and give it width. Again, this makes your guitar sounding bigger and more powerful. For an example listen to the solo on Oblivion and you’ll easily get an idea of how reverb and delay should sound. The Earthquaker Dispatch Master was an easy way to fatten up the Brent sound. Do you think Rabea & Matt got close to the Mastodon sound? Leave a comment below and share your thoughts! Rabea: All right guys, I'm Rabea. We're back at it again with more Sounds like videos. Matt: Yes we are. This is sound like Mastodon. Rabea: By Busting the Bank. Matt: We all know what that means. That means it's colossally expensive, hopefully a lot closer to the rigs they actually use. Rabea: It's exciting, they just released a new album. Matt: It's really good. This is a really well time video hopefully, it should be fun. Last one was really good as well. Rabea: It's going to be really loud, it's going to be really fun and it's going to be really heavy with lots of riffs. Rabea: Sounds like my breakfast. Rabea: Well, I'm doing Brent Hinds and normally we would go for, I suppose with it being Brent Hinds he's got his own signature Epiphone V, which Andertons don't actually have in stock, but because it's “by Busting” I'm just going to get a really, really nice V. Let's have a look. Well , there are two V's here. Rabea: These are the only two it seems. Rabea: These are the new Gibson 2017. Rabea: £1200 is all right. The problem I foresee is that I'm not very good at holding and playing V.
Matt: You have to wedge it in your leg. It'll be fine. Rabea: It's got dirty fingers pickups in it. This is the guitar for me and Brent Hinds. Rabea: Mate, look at that. Matt: - a stonker, and it has lace sensor pickups and this matte black with a greeny burst top here. Rabea: It's a lovely looking guitar. Matt: It is, isn't it, yes? I'm sure it'll sound amazing. So I’m going to use this. Matt: Right, we have guitars, I think we'll be suitably “Masterdon-y”. Rabea: We should get your amp first. Matt: We should get my amp first. Rabea: Because with any look they have the Bill Kelliher Signature Friedman in stock. Matt: Which has an amazing name. Matt: It's called the Butterslax. Matt: So, say 800 pounds for cab. The head is also crazy, crazy expensive but hopefully, well, by the sounds of the other demos I've heard, it should sound amazing. Rabea: Now, we're on to Brent Hinds and this is going to be slightly more of a challenge, purely based on the fact that Brent Hinds uses Diezel, which we can't get but there's also I've seen Oranges and Marshall plexi's and he also uses some Fenders for cleans. The options really are, do I go Orange? Do I go Marshall? Do I go Friedman as well or do I get something unexpected and then get a couple of pedals to compensate? I've made a decision to not use Orange, only because although I think tonally it could be close; the problem with Orange amps is they're meant to be played loud and although we play loud. I think to get the kind of sound out of it that I want to get it needs to be turned up a lot. With a hundred watt valve head, even on half power I think, correct me if I'm wrong, but I just think that's going to be a bit too fizzy and it's going to be hard to control. I had another thought and I was going to ask Matt about this. Brent Hinds uses a JMP Marshall and a Diezel, one of those is the British, vintage British, high gain and the other one's a German modern high gain. I'm thinking Victory VX Kraken because gain one is a JCM 900 style British voiced crunch or high gain and then gain two is your American 5150 style. Rabea: I think it's a convincing argument. Matt: Do it, it's going to be loud enough. It's going to be; maybe get 2x12s, I'm 2x12s as well. Rabea: Couple of pedals, EQ to maybe have extra tonal flex. Matt: If you think you'll get close. Rabea: I think it will get as close. Matt: Especially with the tube screamer up front. Matt: Pedals pedals, let's do Brent Hinds. Rabea: Do Brent Hinds. Ok so obviously he uses a tube screamer style pedal and we've got a plethora of tube screamers to choose from. Rabea: You could go for your standard TS808, you could go for a Maxon TS808, you could go OD9. There's so many different ones but I just spotted this pedal, the Keeley Oxblood. Now I don't know what it is, it looks like a drive pedal of some form here and it's got a fat switch. I'm going to get that just based on the name, because I think that that speaks true to the Mastodon kinda vibe. Do we need to get any kind of leady sounds? Matt: Potentially, we were talking about getting an EQ each, again. Matt: So we should do that. Well, I'm going to get an Octave. Bill Kelliher uses Axe-Fx. Andertons don't stock Axe-Fx, so in this case, I'm going to pick out just some bits of the sound which I'm trying to replicate. So I'll go for an Octave, an EQ should push the amp. I'll hopefully rely on the amp for the rest of the sound given that it's a Signature amp. Rabea: I’m gonna get a Klon as well, because I like what Klons do to the front of amplifiers. Just to see different variations of distortions. Obviously, you've got your Octave and an EQ to just sort of get tones closer. I think I'm going to throw in some form of delay-reverb-style pedal, because Brent plays a lot of lead. Even if we don't play any lead, it's good to have the option there. Rabea: We've got some bits. Matt: We've got some bits. Rabea: All of these, hopefully are going to help us to sound even better than the last time we tried to sound like Mastodon. Matt: Yes. We need to pick up a few more bits out of the back, but these bits should get us a bit closer. Rabea: Let's go grab your bits then. Rabea: We are back in the room. Matt: We are back in the video room. Rabea: I'm just going to say this right now, I think I have found a new favorite tone that we've ever done on Sound Like. Matt: I've got to say, of all the tones, the one Rabea's got here is exceptional. Rabea: I'm well chuffed. Without further ado, let's just jump straight in. Let's start with your rig. Save the best to last. Matt: Okay. Well, basically nice and simple. I have Bill Kelliher's Signature LTD here. Rabea: Which is a beauty guitar. Rabea: It's a really tidy guitar. Matt: It's a really tidy guitar. Really, really beautiful. That is running it directly, well, actually through these pedals obviously, but straight in the front of this Friedman, which is the Butterslax, his signature. Rabea: It's a great name. Matt: It is a great name, isn't it? Great word. But yes, it's a Signature head. That's running into the 2x12, Friedman here as well. One thing to note as always is that it's really exceptionally loud. I have been playing on approximately between -- If 0.5 was a setting, I'd be around there and 1. Matt: It's a LovePedal reverb, yes. Reverb 3. It's a relatively straightforward rig. Rabea: What sound on the amp are you using most of, do you think? Matt: Mostly I was on the gain three channel which is the highest of the three channels gain wise. Yes, gain's riding on about half, and as I said, the master; exceptionally low. It sounds good. It sounds good. Rabea: It's got a really rounded grunty mid thing. Matt: Yes, compressed. With the POG2 for that Octave -- The lower octave sound. Matt: That is my favorite sound. I love a good, a really nice thick high gain sound with powerful guitar, and a nice sub-octave, wins for me every time. Yes, so that's my rig. Relatively simple, but obviously as it's by Busting the Bank it's colossally expensive. Matt: Lets get onto your rig. Rabea: - because I'm well excited about it. Just to point out, I think both rigs sound amazing. I'd happily own either of them. Matt: Definitely, and they do sound really, really different but still is like -- I think on a par quality wise just a different thing. Matt: Incidentally is that the more British one? Rabea: Yes. I know he uses a JMP and the Diezel, we're over our side of pond anyway. In any case that's the amp. I'll show you right after I show you the guitar. I'm not a V guy, however, this is a Gibson flying V 2017. The flying V standard. Rabea: I must admit, now I've learned how to hold them. You put the bottom of the v here and you sit like this. It's nice for that classical guitarist thing. But in any case it works, and this is it straight into the amplifier. The bass focus is pulled out and the gain is on six, just above halfway. To get the tone, essentially at the front I've got the EQ; the Boss GE7. I've got a Maxon OD808. Got a Ryra Klon Clone, and the Keeley Oxblood and then in the loop I've got the Earthquaker dispatch master. So easy one out of the first this is the dispatch master. Just for leads. Like that, then I push GE7 in. Actually takes away a little bit of high mid and fizz - Put the Maxon in; tightens up the low end, gives it more punch and it supplies you with a tiny bit more chord definition. Take it back off- Put it back in. Matt: So, your using it on zero drive again. Rabea: Yes, zero drive, doing the modern approach. Rabea: No drive, level on halfway and tone just above halfway. And then the Ryra Klon; which was a guess if it would work on it, but it totally did. Everything's roughly just under 12 o'clock, so this is without. Rabea: Just before I go back to how awesome that sound is, the Oxblood we literally used for the beginning of Blood and Thunder. So everything stayed on except the Klon and then we put the Oxblood in and this is what you get. The reason that we've done that. It's actually a drive pedal with some cool functionality. You've got a fat switch, a clipping switch, but it didn't sound like Mastodon. I knew it was a guess when we got the pedal anyway. Rabea: I got it because of the name. But it works for that excerpt, so we put all the drive off, level all the way off, tone on full, fat switch out and the clipping stage in. And it gives you that sort of boxy intro to Blood and Thunder. Then you take it off. Put the Klon back in. I could play that for hours. Matt: You can probably get that without spending a lot of money on a pedal. Rabea: I felt like I just needed to use it though. Matt: Of course. But I reckon you can probably get that through the amp. Rabea: As this is Busting, Matthew, I may as well tot up really quick. This is £1200, the amp's £900 the cab’s about £500. So I'm way over two grand there. Then my pedals, in all their entirely is about £600-£700, possibly more. Matt: I think I might have won with money. Rabea: Yes, I think you might. Matt: The head here, the Friedman Butterslax, which is ridiculously awesome, ridiculously loud, is £3500. Rabea: For the head alone. Matt: So, I'm not even going to talk about the rest of my rig. I'm just going to leave you with that price. Rabea: Totally busted the bank, and left everyone for dead. Matt: Exactly. You can check out all the gear and the latest prices in the description box below. Matt: More details of all this cool stuff. Rabea: Let us know what you think. Matt: Yes. Did we sound like Mastodon? That's the question. Rabea: I hope so. I felt like we were Mastodon in a way. I don't have tattoos on my face, but it doesn't matter, because I've found stuff that I'm really happy about. I've learned from this video. Matt: Exactly. I've learned that the riffs are the most fun to play. Matt: It is the most -- If you're wondering what you should do with your life, start a Mastodon cover band. You will not be disappointed. Rabea: On that note, I've been Rabea. Matt: and I've been Matt. Rabea: This has been Sound Like on Andertons TV.